Belkin on Monday announced two new accessories designed for Apple's Lightning connector  the first two official third-party accessories designed for the new iDevice port. Belkin's Car Charger for Lightning and Charge + Sync Dock will both be available this year, and will be the first Lightning accessories to hit the market. "Belkin was the first third-party manufacturer to develop accessories for the 30-pin connector back in 2003, and we are thrilled to be first to market again with solutions for the new Lightning connector," said Martin Avila, general manager of Belkins core division. "People are eager for Lightning accessories and Belkins give them a reliable way to keep their new iPhone 5, iPad 4th generation, iPad mini or iPod touch charged, protected, and ready to go." 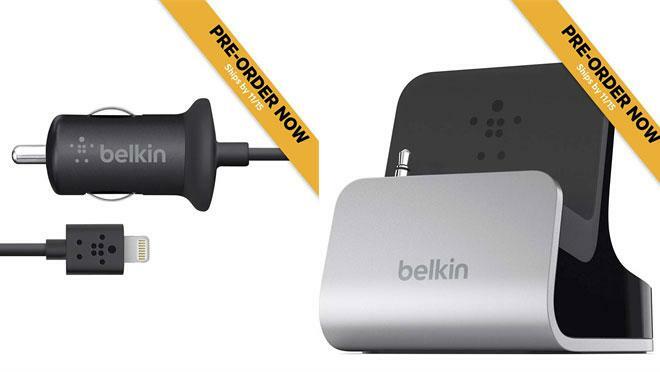 Lightning accessories from Belkin are available for preorder now on the company's website. They will go on sale in mid-November. The Belkin Car Charger for Lightning will cost $29.99, and is an updated version of Belkin's best-selling, slim-profile car charger. It features a hardwired 4-foot Lightning cable, and over-voltage to protection. The Belkin Charge + Sync Dock is case-compatible with a foldaway auxiliary jack, removable magnetic base, and cable channel for easy cable feeding. The dock does not include a Lightning cable, but is intended to be used with Apple's official Lightning connector cable. The dock also includes an audio out port for headphones or speakers. It is particularly noteworthy because Apple does not offer an official iPhone 5 dock. The announcement of Belkin's new authorized accessories suggests that Apple's Made for iPhone conference may have taken place. The company was expected to hold an event this month to discuss the terms of the Lightning connector with third-party accessory manufacturers. Though Lightning cables include an authentication chip, the technology has been reverse engineered by some companies in China that have begun making unauthorized Lightning cables. One cable detailed by AppleInsider last week was found to be compatible with Lightning devices, though it achieved a low price with poor shielding and cheap parts.